For most drivers, when you suddenly see flashing red and blue lights in your rear view mirror, you will likely be frightened to some extent. 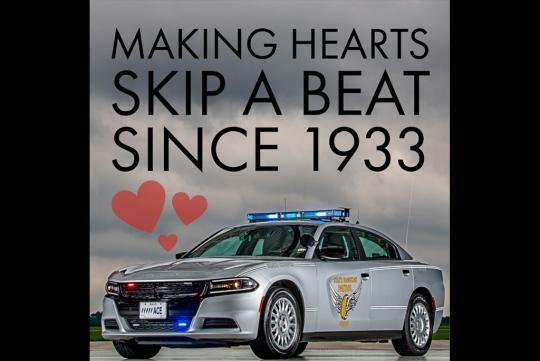 The Ohio State Highway Patrol is well aware of that and they have made use of that feeling to create an amusing Valentine’s Day message. Using its Dodge Charger Pursuit car along with a message that reads 'Making hearts skip a beat since 1933. ', they posted a photo of their valentine greeting on Facebook.